The Bourbaki wedding invitation is probably the most effective branding- and marketing-campaign in the history of mathematics. It was pretty easy to decode the date of the wedding “3 Cartember, year VI” to be June 3rd, 1939, and (a bit more difficult) the wedding place “the Principal Cohomology of the Universal Variety” as the l’église royale Notre-Dame du Val-de-Grâce in Paris. The identity of the celebrating priest “P. Adic, of the Diophantine Order” remained unclear. The most likely suspect was Helmut Hasse, but I couldn’t place him in Paris on June 3rd, 1939. Hasse is the central figure in the title picture, taken in Oberwolfach in 1952, before one of his cars. Here’s another picture of car-freak Hasse (trains were to Andre Weil what cars were to Helmut Hasse). Thanks to Peter Roquette’s publishing of Helmut Hasse’s letters we can now prove that Hasse was not in Paris on that particular day (however, he was there a couple of days earlier) but Weil had every reason to believe he might be there at the time he wrote the wedding invitation. We know that this picture is taken on May 13th 1939 so the wedding-invitation was drawn up around mid april 1939. 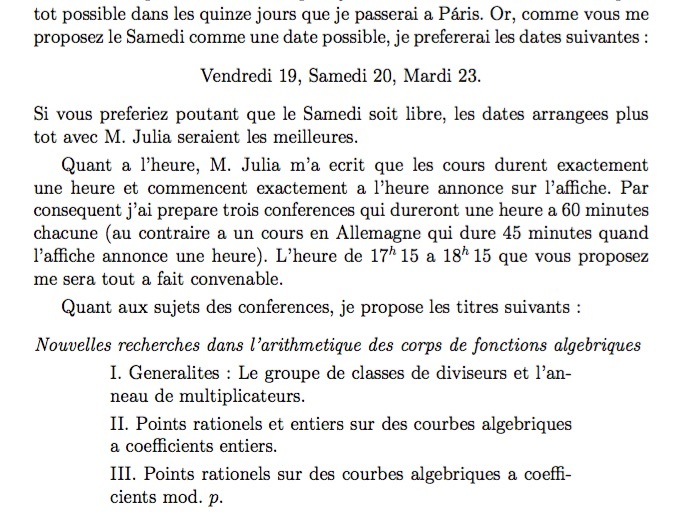 Hasse had been invited by Julia to give a series of lectures at the Institut Henri Poincare in 1938, but Hasse postponed his trip to Paris until May 1939. Clearly, Weil was aware of the upcoming visit of Hasse to Paris at the end of May, and there was no reason for him to assume that he wouldn’t be able to stay a weekend longer. He also mentions that he would stay for 15 days in Paris, arriving on May 17th, in time for the Jubilee Conference for Elie Cartan, scheduled on May 18th. 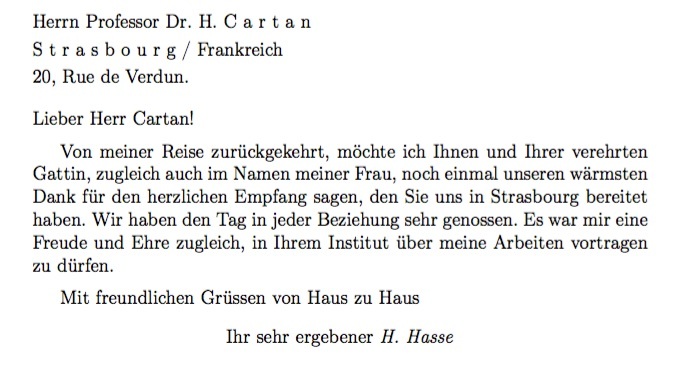 Weil must have known that Hasse would be present at the Cartan-fest and give a series of lectures in the following weeks. He had every reason to believe that Hasse would still be in Paris on Saturday June 3rd. If you want to catch up with previous posts on the Bourbaki wedding, you might want to download the booklet The Bourbaki Code.